(Update 13, 9:25 p.m. PST) Six are confirmed dead in the shooting Thursday at Northern Illinois University's DeKalb campus, including the gunman, who died of a "self-inflicted gunshot" before police arrived on the scene. Four of those fatalities were dead on the scene; two died of their injuries later in the hospital. All of the injured were students, according to NIU President John G. Peters, including an injured graduate instructor. The gunman was a former NIU graduate student in sociology. There were 22 total injured or killed in the incident. Eighteen were taken to Kishwaukee Community Hospital in Illinois following the shooting; three were discharged soon after, and eight have been discharged so far. Over the course of the day, six were flown to other hospitals. Of those who were killed, four were female; two were male, including the gunman. The shooter himself was not a student at the campus at the time, according to information released by the university. He was, however, a graduate student in sociology in spring 2007. The shooting took place at approximately 3 p.m. Central Standard Time. The university has reported that police were on the scene within two minutes. An alert was posted on the school's site at 3:20 p.m. Central Standard Time urging campus community members to "get to a safe area and take precautions until given the all clear. Avoid the King Commons and all buildings in that vicinity." According to Peters, alerts were also sent out via e-mail and other mass communications media at the same time. This was roughly 20 minutes after the shooting began--approximately 3 p.m. CST. In a press conference this afternoon, he said there was no threat prior to the incident. Twenty minutes after the initial alert went out, classes were canceled on DeKalb campus. A shooting was confirmed at 3:50 CST with a report that "several people have been taken away by ambulance." The alert at that time urged community members not to come to campus. The scene was reported secure at 4:10 p.m., and classes have been canceled for Feb. 15. "Campus police report that the immediate danger has passed," a 4:14 p.m. alert reported. "The gunman is no longer a threat. All NIU classes are cancelled and campuses are closed for tonight and tomorrow. Students can go to any residence hall for counseling." Psychological services have been set up, and the university has six hotlines operating for students and parents. NIU serves more than 25,000 students. 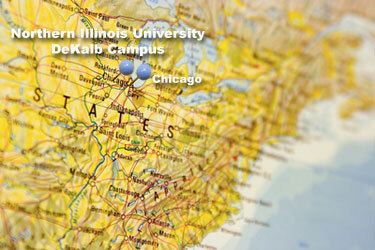 According to the university, the FBI is now "processing the crime scene and the investigation is being aided by the Illinois State Police, the Bureau of Alcohol, Tobacco & Firearms, the State Crisis Management Team, the City of DeKalb Police, City of Sycamore Police, DeKalb County Sheriff's Department, the Ben Gordon Center and the DeKalb, Sycamore and Cortland Fire Departments, as well as FEMA." The names of the victims and the gunman have been released and are available on NIU's Web site.